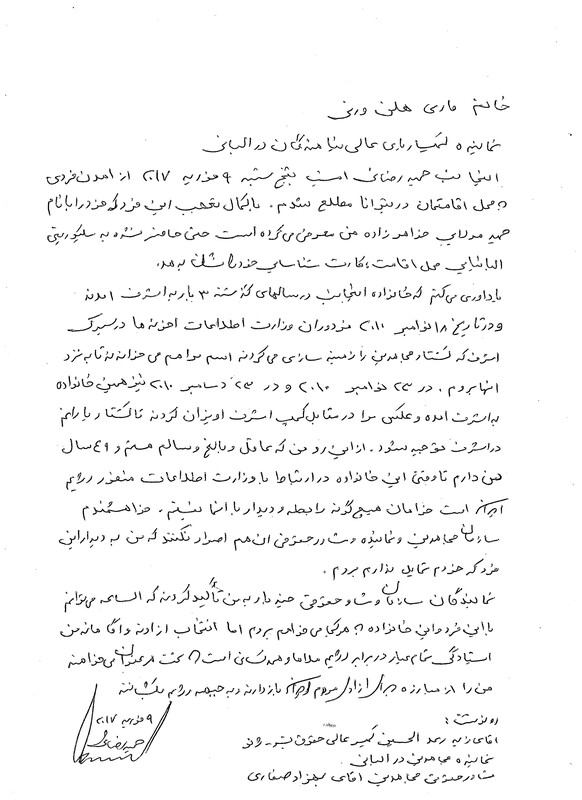 Since summer of 2016 that the last group of MEK members left Iraq and resettled in Albania, the Iranian regime’s notorious Ministry of Intelligence and Security (MOIS or VEVAK) has focused its activities in Albania around the MEK, either to discredit them by posting bogus stories and allegations in some hired websites or dispatching its agents to Albania under the guise of relatives of MEK members to foment disturbances. Hamid Rezaei from MEK in Albania is one example that MOIS has picked up on him by dispatching its agents living abroad to his residence in Albania twice this year alone. They claimed to have a family meeting with Hamid, but as Hamid announced their mission was to lure him to leave rank of the MEK and to join the Mullahs in Iran. Hence he refused to meet with them. He has written two letters each time that the dispatched MOIS agents tried to meet with him. The letters are self-explanatory. I, Hamid Rezaee was informed tonight, Thursday, 9 February 2017, about a person who came to my residence place in Tirana. This person who introduce himself as my nephew with name of Hamid Moulaee, surprisingly was not ready to present his ID to the Albanian security guard at the entrance of our residence place. I would like to let you know that my family came to Ashraf three times to see me in the past years. Furthermore, on 18 November 2010 the agents of the Iranian regime’s intelligence ministry who gathered outside Ashraf to justify the massacre of the residents, called me by my name in order to join them. On 23 November and 23 December 2010 the same family members came out side camp Ashraf and hanged my photo in front of the camp, again to justify the killings of my friends. Since I am a 49 years old mature and wise person, as long as this family is in contact with the hated MOIS, I do not want to have any relations with them. 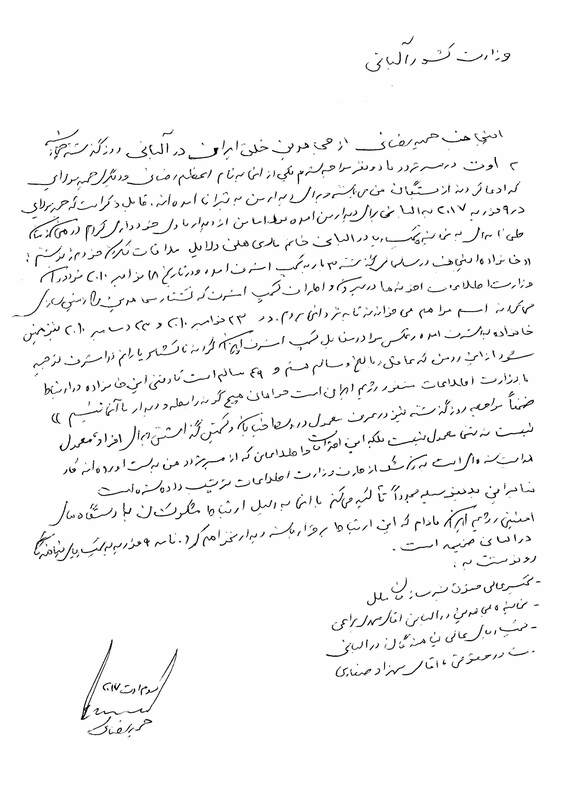 I have also requested the PMOI and its representative and legal advisor not to insist me to see this person that I do not want to. The PMOI representative and legal advisor emphasized on me several times that I could leave at once and go to any place together with this person and my family. However, my knowingly and free choice is an all-out steadfast stand against the mullahs’ regime and anybody who wishes to stop me from the struggle for liberation of the Iranian people. Yesterday’s ambush-like approach in the middle of the street is not a normal and common thing to do. It is not only uncommon rather it is a guided measure by the Iranian regime’s Ministry of Intelligence to gather information about my where I go. Hereby, once again I stress that as long as these people have relations with the Iranian regime’s Ministry of Intelligence I will not visit them. My letter to UNHCR on 9 February 2017 is attached.